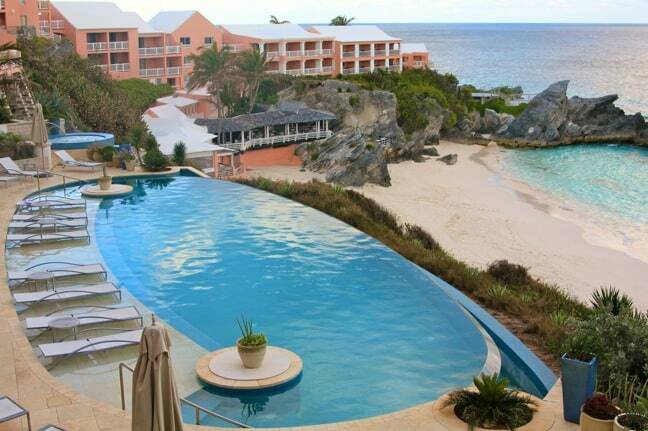 Bermuda would not normally be my first choice for an ecotourism vacation destination. 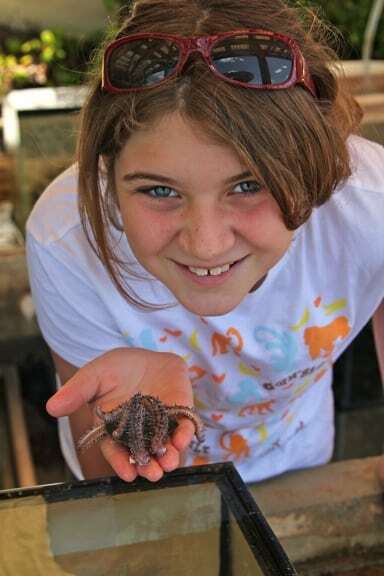 But when I got a major assignment from a Magazine to do a story about my daughter’s burgeoning interest in marine science, we quickly pulled a press trip together to the veddy British island. We couldn’t have been happier with our accommodations: The Reefs put us up in an incredible 2-bedroom condo that was twice the size of my first apartment, with a hot tub on the balcony and amazing views of the crystal clear aquamarine ocean. 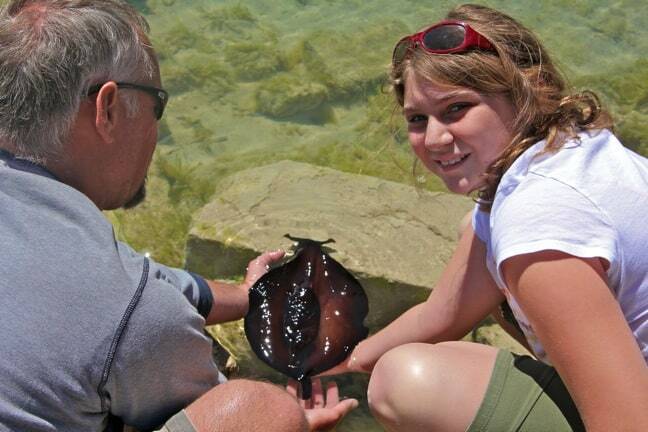 My daughter, Alex, has grown increasingly interested in nature and wildlife over the years, and in the past year has suggested she may want to be a marine biologist or perhaps work in marine science education. After giving us a brief tour and an overview of BIOS’ current projects (which include studying the grasses of Bermuda’s Sargasso Sea and the effects of climate change on the ocean), diving coordinator Alexander “Dready” Hunter allowed my daughter to help out with a research project. They were studying how acidity impacts the growth of coral reef: Different types of coral had been submerged in 9 bins, and she helped dip test tubes into the water to take samples. The cylinder pumping the water with the highest alkalinity was covered in corrosion, and it wasn’t hard to imagine its long-term impact on marine life. In the touch tank area, Dready let Alex hold a tiny sea star and asked her to feed a huge anemone, whose tentacles wiggled whole trying grab the food as it floated down. But her favorite part of the morning was when Dready saw a sea hare (which looks to me like a cross between a snail, a bat and a manta ray), stuck under a rock near the shore. I snapped a few quick photos before she and Dready set it free, and Alex was clearly elated (I believe “That was SO awesome!! !” was a direct quote). Eventually we said our goodbyes to the great staff at BIOS and made our way to the Bermuda Aquarium, Museum & Zoo. 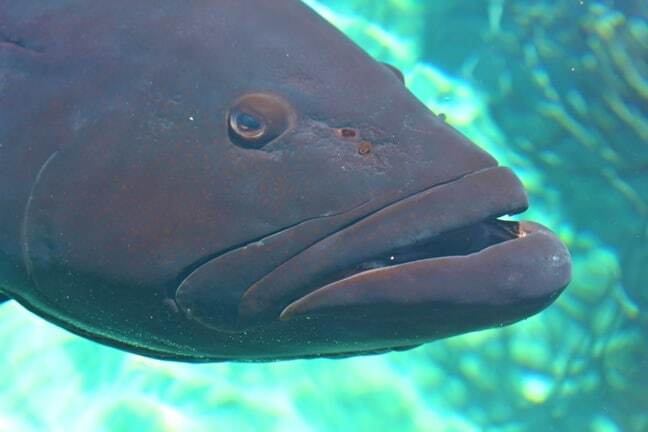 There, we met Dr. Mark Outerbridge, who gave us a tour of the facility that included a rooftop view of a massive exhibit that included nurse sharks, a barracuda, and a 5-foot long grouper named Vader. Ain’t he handsome with those orange spots? I’m fairly certain Vader thought he was a puppy dog: He came when you called (by splashing your hand on top of the water), and he loved to be pet. The craziest part? He liked to be pet inside his mouth, and would hold it open for you to do so! 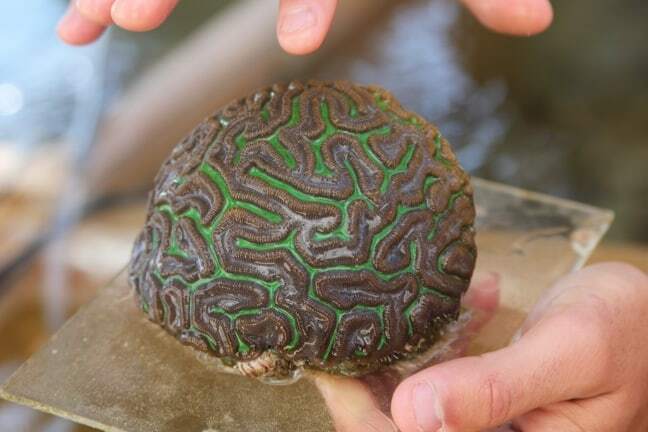 Outerbridge, head of the Bermuda Turtle Project, told us five sea turtle species pass through Bermuda’s waters annually, and that the green sea turtle is a keystone species for Bermuda’s marine conservation efforts. Alex has always dreamed of seeing sea turtles, so when Outerbridge asked if she’d be interested in feeding them I thought she’d explode with giddiness. 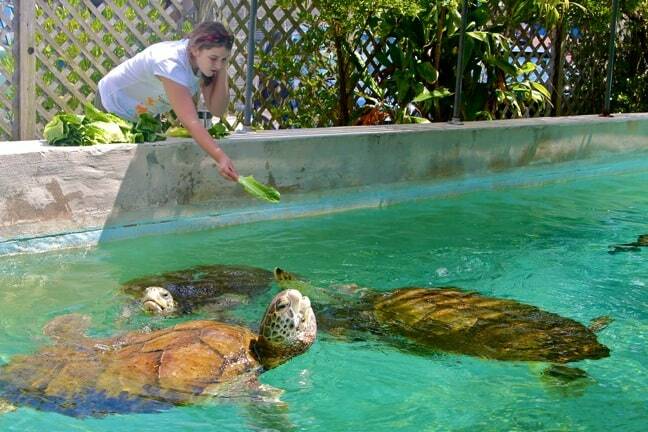 We grabbed 8 heads of lettuce and walked to a huge swimming pool enclosure that held five huge sea turtles. My kiddo seemed entranced as she hand-fed them all, piece by piece. The turtles loved it just as much, and were hilarious as they scrambled over each other to get to every morsel. After our time with Dr. Mark was over, we took some time to explore the small but well-kept zoo, which is primarily focused on wildlife rescue and rehabilitation. 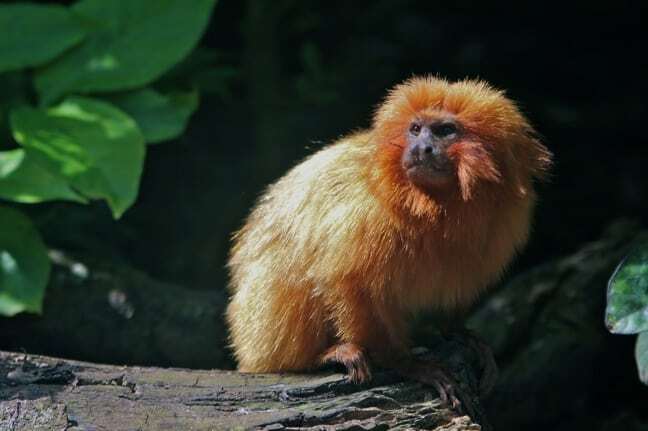 This endangered Golden Lion Tamarin (a.k.a. Golden Marmoset) is one of less than 500 individuals in captivity, with just an estimated 1500 left in the wilds of Brazil. It was interesting because he was not kept in a cage, but was instead allowed to roam freely inside a massive, naturalistic enclosure that included a broad variety of birds, trees and even a waterfall. He didn’t seem at all bothered by our presence, but kept a safe distance away as we snapped his handsome profile. This may be the first photo my 10-year-old daughter has taken to ever appear on Green Global Travel! Not a bad shot, huh? 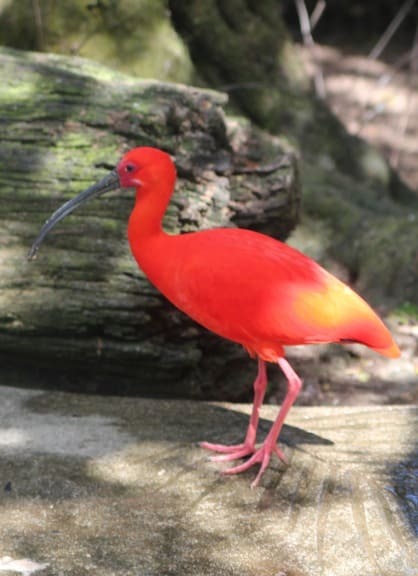 There was a small group of scarlet ibis feeding on some sort of organisms in a tiny stream near the tamarin (which I was filming on video at the time). But she managed to get a shot of this one off by himself along the path, with a beam of sunlight streaming through the tree canopy directly onto his back. The next morning we’d arranged a Fantasea snorkeling tour off the Bermuda coast, and took a long boat ride out in the chilly April morning air. Along the way we passed by these vividly colored buildings, which for some reason reminded me of the famously picturesque waterfront in Willemstaad, Curaçao. As we got closer and closer to our snorkel site, it seemed like the wind picked up more and more, chilling us to the bone. Alex and I are both VERY warm by nature, but even I seriously began to question my resolve to submerge myself in waters I knew would be in the upper 60s or lower 70s at best. As I saw several White-Tailed Tropicbirds (a.k.a. 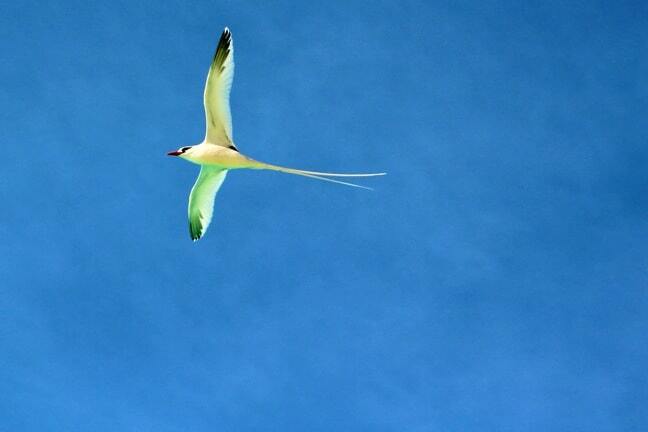 Longtails) soaring high above, I began to wish I had wings to take me as far away from the frigid water as possible. Of course, ultimately we bit the bullet, froze our butts off and had a blast anyway, despite the fact we didn’t see much. In fact, the snorkeling right off the beach at The Reefs was much better! 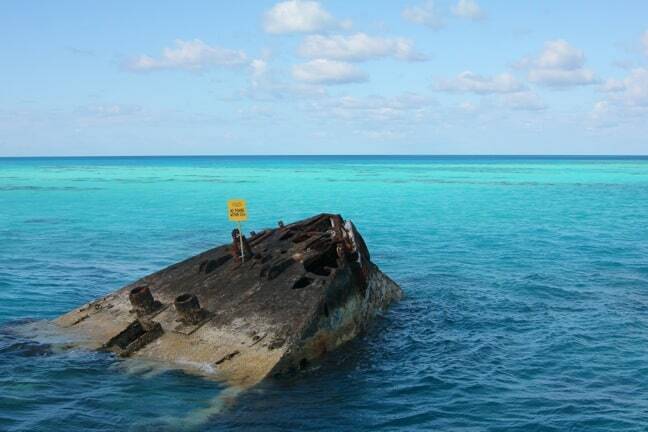 We were hoping to get a chance to snorkel one of Bermuda’s famous sunken ships, but the water was too choppy. The glass bottom boat afforded clear views of the HMS Vixen, an armored Royal Navy gunboat (the first ever to have twin propellers) intentionally sunk just off the coast of Daniel’s Head, Bermuda in 1895. But there weren’t a lot of fish around, and the overall experience wasn’t nearly as exciting as when I snorkeled a massive sunken battleship off the coast of Aruba a few years ago. We may be serious about “Saving The World, One Story At A Time.” But we (and by we, I mostly mean me) can be extraordinarily silly at times. In fact, I have a game I like to play with Mary and Alex I affectionately refer to as the eyeroll game. Basically, I act like a total goofball to see how long it’ll take one or both of them to smile and roll their eyes. 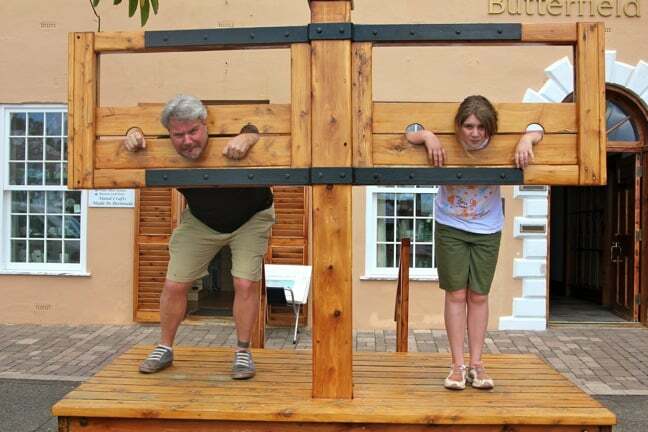 Here, I’m acting a fool in the stockades in King’s Square in the historic town of St. George (a UNESCO World Heritage Site). Doesn’t Alex look amused? In addition to my love of ecotourism, I’m also a bit of a world history nut. 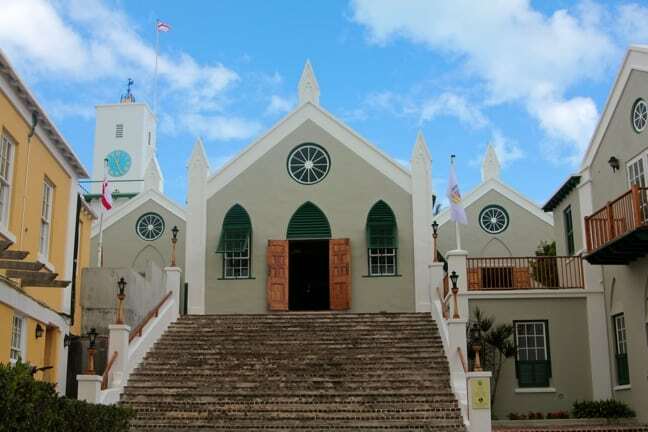 So I was fascinated by Saint Peter’s Church in St. George, the oldest surviving Anglican church in continuous use outside the U.K. and also reported to be the oldest continuously used Protestant church in the New World. 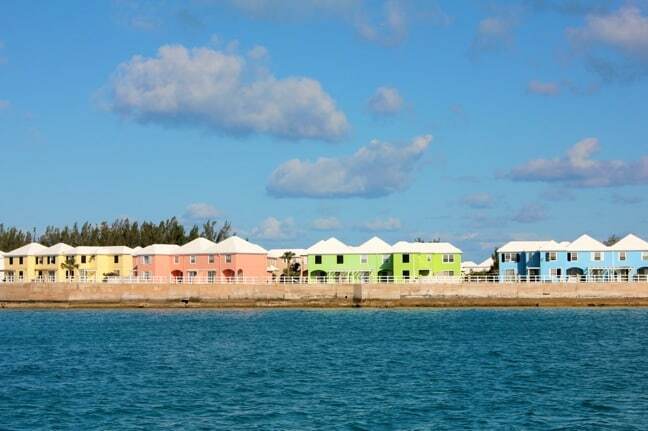 Though it’s been rebuilt several times due to Bermuda’s famously stormy weather, the oldest parts of the current structure date all the way back to 1620. In March 2012, Queen Elizabeth granted Saint Peter’s the title Their Majesties’ Chappell to honor its 400-year history. 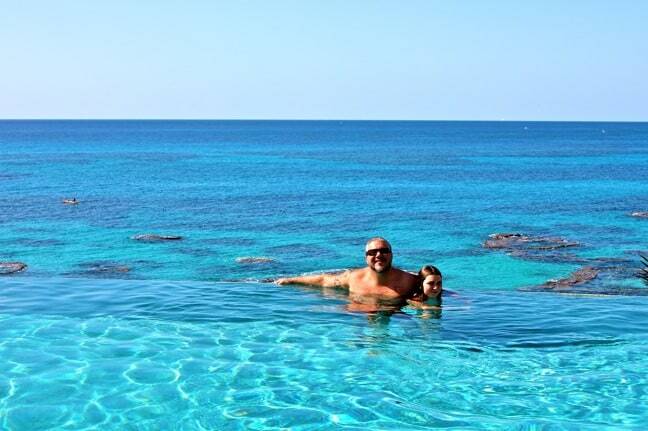 Here we are chillin’ in the infinity pool at The Reefs. If you look in the background, you can see the circular reefs known locally as the Boiling Pots because, as the tide rushes in, it looks as if they’re boiling over. They provided amazing snorkeling opportunities, and Alex and I spotted flounder, puffers, a massive grouper and a Portuguese Man O’ War among hundreds of other brilliantly colored fish. Between the snorkeling, kayaking and other watersports available at The Reefs, we honestly wished we had a few more days to explore. 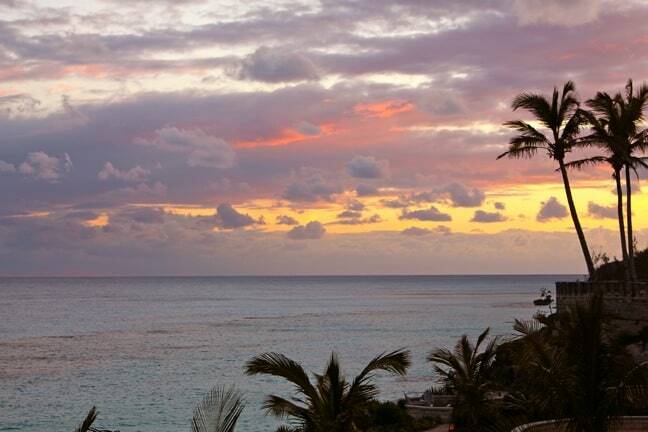 Unfortunately, after just two and a half days in Bermuda, it was time to head home again. Alex had to get back to school, and Mary and I were leaving for our big trip to Islas Secas, Panama the following week. But that’s a story for another time. Although Bermuda wasn’t high on my list of places to visit, it taught us that you can almost always find great ecotourism options if you look hard enough.